The attribution to the Darte Frères factory is based on a comparison of the shape and distinctive handles with a pair sold Christie's London, 24 February 1997, lot 271, of which one was stencilled with the iron-red factory mark. A vase of similar form is in the Musée National de la Ceramique at Sèvres. Another is illustrated by Régine de Plinval de Guillebon, Porcelain of Paris, Lausanne, 1972, fig. 142. The rich reflective burnished gilding on the reverse of the vases may seem extravagant for a surface that would not normally be visible. 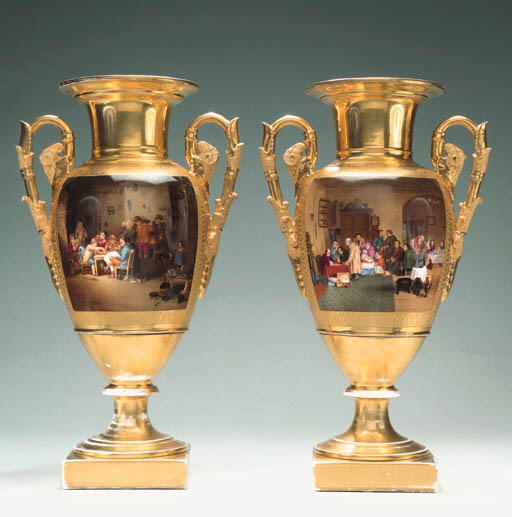 This, however, is to forget the role of the mirror, which at this date served as both a vehicle for extra light and to reflect the reverses of vases de cheminée such as these.